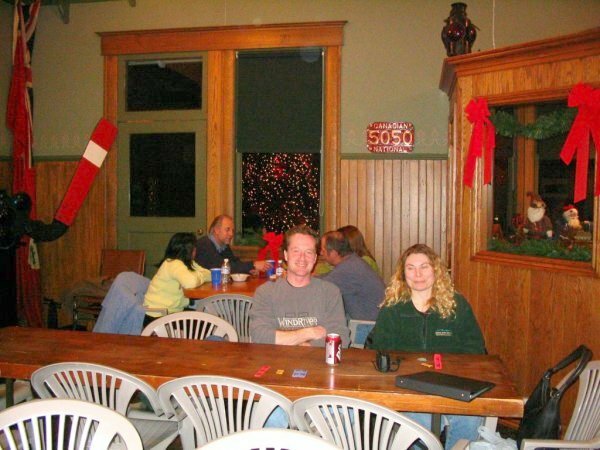 On December 11th/2004 we held our 3rd annual Christmas Party at the Caledonia Train Station. The event was a big success. We want to thank all the folks that came to this event with all the food and drinks to make this night one to be remembered for a long time to come. A special thank you goes out to Steve Geller for donating $25.00 towards the costs of the party. Another big thank you goes out to Tia for her donations of the wooden sculptures she had donated for door prizes. This really helped with the party this evening and everyone enjoyed themselves. Down below are the pictures that were taken at the party. Wishing everyone a very Merry Christmas and a great New Year!!!!!!! 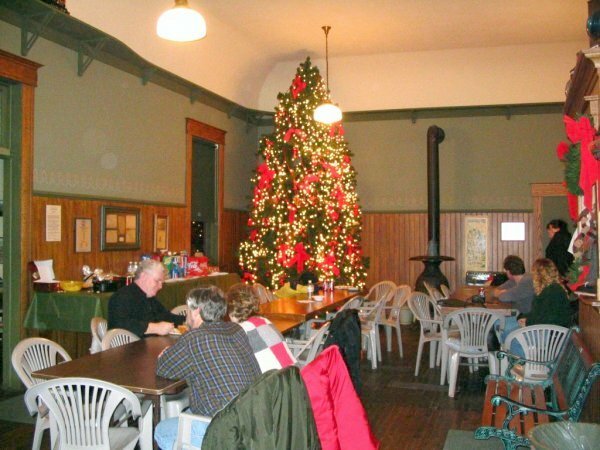 In this photo you can see the huge tree covered with lights inside the train station. I was trying to eat my dinner but ended up talking instead with Jackie and Bob. Two great newcomers that showed up. Now here was a happy couple. 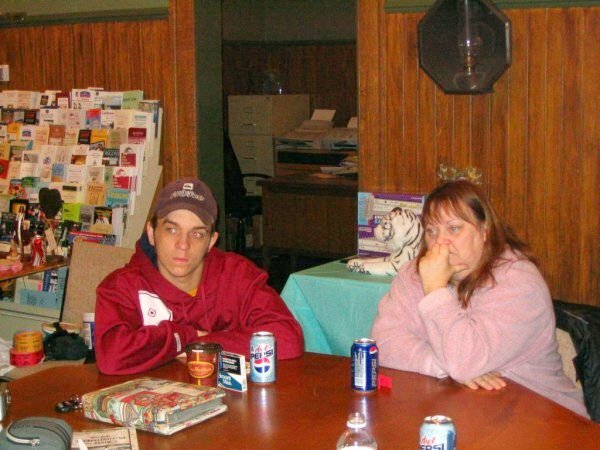 Lisa and Chris that came to the party. I see the tickets on the table by Chris. He's hoping to WIN a few goodies. 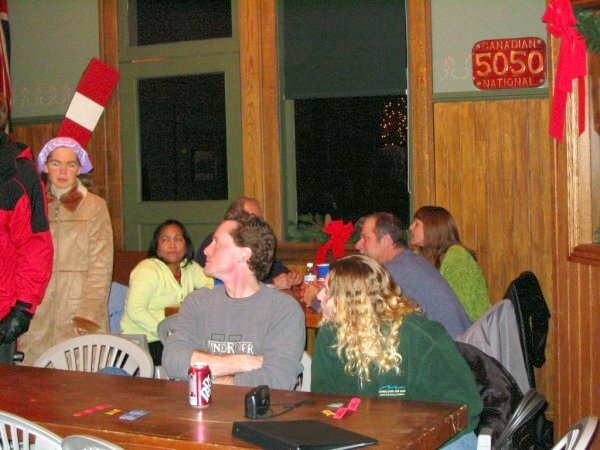 It appears as though Chris and Lisa thought at first it was the cat in the hat person that came to this event, when in fact it was Alex's sister Kathy. What appears as a hat was actually one of the old signals from the tracks that gave this effect. 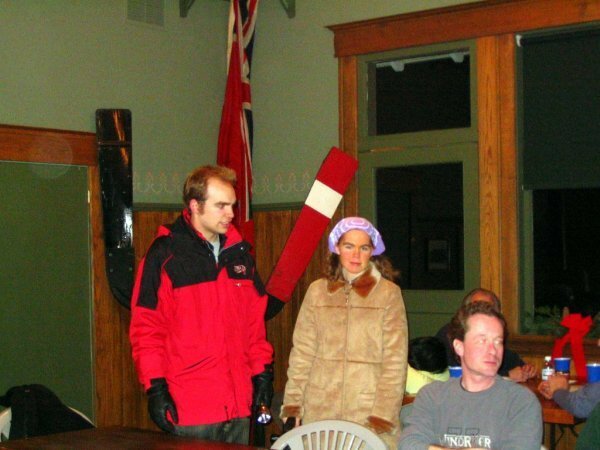 Alex looks like he is getting ready for going outside in the cold, and Kathy notices the camera was aimed in her direction giving a look of surprise. Christine sitting at the back of the table trying to wave like the queen does. Keep up the great work there Christine you just might make it. Cindy over to the right of the picture was impressed at the queen's wave and started to try it for herself... Rob with the bandana on his head was wondering why all the fuss about the wave. Simon was too busy looking at one of our cards to notice the wave.